Chiropractic care uses a variety of techniques and equipment to properly align the spine, enabling the nervous system to function at an optimal level so the body can heal naturally – without medication or surgery. Chiropractic care is based on the premise that the body can heal itself faster and function correctly when the nervous system is properly supported. The goal of a chiropractic physician is to remove interference to and from the brain by restoring the spine to its proper position. This allows the brain to send clear signals to the rest of the body so it knows how to function. Chiropractic care can also be used to restore mobility and balance in other joints, such as the knees, feet, hips and shoulders. There’s a big difference between seeing a chiropractor and coming to Natural Healthcare Center and seeing a chiropractor. Dr. Proodian, Dr. Hostnik, and Dr. Desiderio offer more than a chiropractic adjustment. 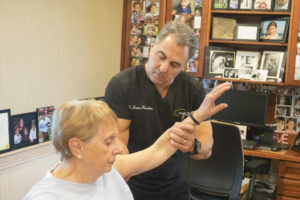 They know how to connect the dots, for example, between chronic back pain, poor nutrition and stress by analyzing diagnostic imaging, blood tests and patient history. Rather than simply making the pain go away, the goal of our chiropractors is to treat the whole patient and make sure they have the information they need to make healthy lifestyle choices. Most people associate chiropractic care with back pain. Chiropractic can indeed be very effective for treating back and neck pain, hip pain, sciatica, headaches and other types of pain. But the value goes far beyond pain relief. Chiropractic care can improve your posture and balance, which can reduce strain on your joints and organs. It can improve digestion and help you get a better night’s sleep. By removing obstacles from the nervous system, chiropractic can also reduce the risk of injury and help prevent the onset of chronic illness. Cox Technic Flexion Distraction and Decompression Therapy has been proven successful in treating degenerative disc disease or disc injuries of the cervical, thoracic and lumbar spine. This protocol is intended to maintain a low intradiscal pressure for a long enough period of time, typically three months, to allow adequate healing. Cox Technic also makes it possible to place the spinal joints into normal movements and restore spinal motion for patients with other painful conditions, such as facet syndrome, spondylolisthesis, sprain/strain, scoliosis, transitional vertebra, sacroiliac restrictions and misalignment, and certain types of spinal stenosis. At Natural Healthcare Center, we have the latest Cox Technic tables for patient care. All chiropractors at Natural Healthcare Center are skilled in this technique for the thoracic and lumbar spine. Dr. Proodian is also being certified for the cervical spine. We specialize in treating athletic injuries, with an emphasis on correcting and preventing musculoskeletal and connective tissue injuries and biomechanical imbalances. We treat athletes of all ages and abilities, from beginners to first-time marathoners to collegiate and professional athletes. Dr. Proodian is a Certified Chiropractic Sports Physician (CCSP) as well as a Certified Sports and Conditioning Specialist (CSCS). He heads this department within Natural Healthcare Center. Several physiological and endocrinological changes occur during pregnancy to create the best possible environment for the baby to develop. Our physicians specialize in establishing pelvic balance and alignment to support the mother’s ability to have a natural, non-invasive birth by getting the baby into an ideal position for delivery. Chiropractic care during pregnancy can also control symptoms of nausea, reduce the time of labor and delivery, and relieve back, neck or joint pain. Myofascial release is a soft-tissue treatment aimed at breaking up myofascial adhesions (scar tissue). Myofascial release is not the same as getting a massage. There are very specific protocols aimed at maximizing the effectiveness of this treatment for any muscle in the body. We are experts at locating and treating areas where adhesions have formed. How Does Chiropractic Care Fit into Our Integrative Model of Care? 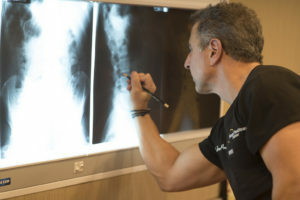 Our chiropractic physicians are spinal specialists who use the most advanced, evidence-based therapies and techniques to strengthen and stabilize your body and support rehabilitation and healing. All chiropractic patients receive massage therapy as part of their treatment. No longer a luxury, we consider massage therapy to be an essential part of healing. Of course, our patients love every minute of it. The entire team of specialists at Natural Healthcare Center – chiropractors, physical therapists, clinical nutritionists, acupuncturists, massage therapists and podiatrists – collaborate to diagnose the root cause of your health problems, develop a personalized treatment plan, and educate you to make smart lifestyle choices that can help you prevent injury and maintain your good health. A misaligned spine can cause pain, aggravate chronic conditions, and slow the healing process. As part of your complimentary consultation with Dr. Proodian, we can get to the bottom of what’s bothering you and determine if chiropractic care should be part of your treatment plan. Bring your healthcare records, diagnostic imaging, test results, prescriptions and nutritional supplements. Dr. Proodian will review your records, discuss your history, answer your questions and determine next steps based on your specific condition – all at no charge.